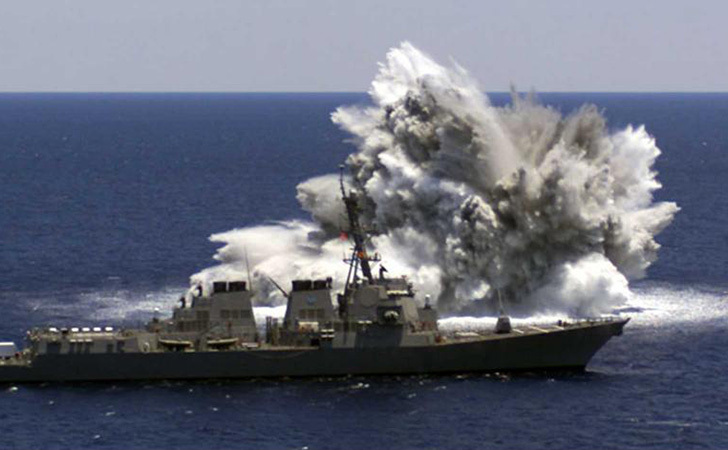 CSA Ocean Sciences Inc. (CSA) was instrumental in providing environmental services in preparation for and approval of underwater explosive (UNDEX) testing of the SEAWOLF submarine and WINSTON CHURCHILL (DDG 81) guided missile destroyer. Starting in 1992, CSA preliminarily assessed 16 potential test sites off the eastern U.S. and Gulf of Mexico coasts with the goal of selecting and including alternative sites in National Environmental Policy Act (NEPA) Environmental Impact Statements (EISs). The assessments were based on multidisciplinary literature; geographic information system (GIS) data; other existing information; and federal and state agency laws, regulatory requirements, and concerns. CSA conducted side-scan sonar, magnetometer, and video and still camera data collection field surveys; prepared exclusion zone maps; and designed a study plan for acoustic analysis of the UNDEX testing. In support of the EISs, CSA conducted aerial surveys for marine mammals and sea turtles in 1995, 1997, and 1999 to provide estimates of the spatial and temporal abundance of listed (endangered and threatened) and non-listed species. The National Marine Fisheries Service (NMFS), U.S. Fish and Wildlife Service, and other agencies were concerned primarily with marine mammals and sea turtles protected by the Endangered Species Act and Marine Mammal Protection Act. While six monthly aerial surveys for marine mammals and sea turtles were required for the SEAWOLF project, CSA was able to scientifically convince NMFS to accept a reduced scope of only two months of aerial surveys for DDG 81, resulting in a savings of over $700,000 for the Navy. Marine mammal and sea turtle sightings were entered into a computerized database and mapped using GIS. CSA then used DISTANCE analysis software to generate population and density estimates. Final exclusion zone mapping also considered other issues such as essential fish habitat and human use areas that might be impacted by acoustic energy from the shock trials. The final site selection process required a delicate balance between operational necessity and environmental sensitivity. CSA prepared two EISs for shock testing the SEAWOLF submarine and DDG 81 destroyer based on this information according to regulations for implementing NEPA procedures from the Council on Environmental Quality and the Department of the Navy. CSA arranged, conducted, and reported on Public Scoping Meetings for public and agency comments on the proposed actions. CSA prepared sections for the Introduction (including Purpose and Need), Alternatives, Existing Environment, Environmental Consequences, Mitigation and Monitoring, Cumulative Impacts, and Unavoidable Adverse Environmental Impacts as well as other NEPA sections. Existing Environment and Environmental Consequences sections provided information necessary to determine potential environmental impacts associated with geology and sediments, physical oceanography, meteorology, water quality, ichthyoplankton, Sargassum communities, invertebrates, fishes, sea turtles, marine mammals, birds, and socioeconomic factors (commercial and recreational fisheries, artificial reefs, cultural resources, oil and gas activities and infrastructure, ship traffic, shipwrecks, offshore dredged material disposal sites, dumpsites, marine sanctuaries, and communication cables). CSA addressed Executive Orders 12114 and 12898; Biological Assessments to meet Endangered Species Act requirements; Letters of Authorization for incidental take of marine mammals required by the Marine Mammal Protection Act; Coastal Zone Management Act and Consistency Determinations; Essential Fish Habitat Assessments according to the Magnuson-Stevens Fishery Conservation and Management Act and Sustainable Fisheries Act; Marine Protection, Research and Sanctuaries Act; and Migratory Bird Treaty Act. CSA coordinated Public Meetings concerning the Draft EISs, and prepared Final EISs that addressed all public and agency comments. Both EISs were described by the Navy as benchmarks for future environmental documentation.